Commemorative Netherlands stamps were issued every year, during the period from 1937 to 1939, though they were few in number. The three commemorative postage stamps shown above (NVPH #293-95, Sc. #206-08) were issued on April 1, 1937 to publicize the Fifth Boy Scout World Jamboree, to be held in Vogelenzang from July 31 through August 13, 1937. 01 1/2 C. - Boy Scout emblem. 06 C. - Flags and marching drum. 12 1/2 C. - Hermes (Mercury), the messenger of the gods. The three pictorial stamps shown above (NVPH #310-12, Sc. #209-11) were issued on August 27, 1938 to celebrate the 40th Anniversary of the Reign of Queen Wilhelmina. The two commemorative Netherlands stamps shown above (NVPH #323-24, Sc. #212-13) were issued on June 15, 1939 to celebrate the 1,200th Anniversary of the Death of St. Willibrord. 05 C. - St. Willibrord, as a younger man, arriving on the Frisian coast. 12 1/2 C. - St. Willibrord as the Bishop of Utrecht. 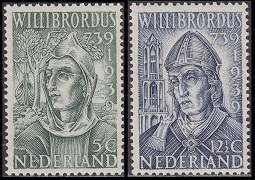 Willibrord (658-739) was an Angle missionary from Northumbria (England), revered in the Netherlands as the "Apostle to the Frisians". Willibrord grew up under the influence of Wilfrid (633-709), the Bishop of York. He became a Benedictine, and as a youth, he worked at the Abbey of Rathmelsigi (Ireland), a center of European learning in the 7th Century. Willibrord was assigned the mission of traveling to Frisia to Christianize the pagan North German population there. Willibrord traveled to Rome in 695, where Pope Sergius I (650-701) consecrated him as the Bishop of the Frisians. He returned to Frisia to preach and to establish churches, among them a monastery at Utrecht, where he built his cathedral. For this, he is considered the First Bishop of Utrecht. In 698, he established the Abbey of Echternach, in present day Luxembourg, on the site of a former Roman villa that had been donated to him as a gift. Willibrord died in 739 at the Abbey of Echternach, and he is buried there. He was sanctified very soon after his death. The two commemorative stamps shown above (NVPH #325-26, Sc. 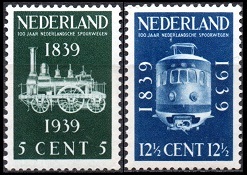 #214-15) were issued on September 1, 1939 to celebrate the 100th Anniversary of Dutch Railroads. The two designs feature a locomotive of 1839 and an electric railroad car of 1939.